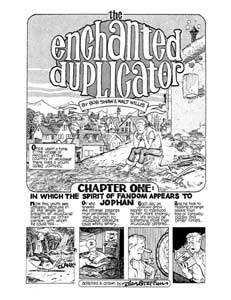 The Enchanted Duplicator is indeed enchanted – the ink on one edition is hardly dry before someone is publishing another. There have been nine editions to my knowledge, though no-one has counted recently that I’m aware of. The very first edition, of course, was the one published by Walt Willis himself, with George Charters. Written by Willis and Bob Shaw, it appeared in 1954. It was without illustrations other than the first map by Shaw. In most cases, a fanzine goes quickly out of circulation, no matter how elaborate or how celebrated in its day. But The Enchanted Duplicator – TED – seemed to be an exception from the start. It wasn’t enough for successive fans to simply reproduce the original pages, either. In 1962, Ted Johnstone and George Fields republished TED, typing all new stencils and securing Eddie Jones for a new series of illustrations. BoSh’s original map was carried over. In 1971, Arnie Katz and rich brown added a completely new third edition, with illustrations by the incomparable Ross Chamberlain. Ross’s map of Jophan’s travels became the new standard. The year after that, Ted White serialized The Enchanted Duplicator in four parts, without illustrations, through the pages of Amazing Science Fiction. It was run as installments of “The Clubhouse,” normally a feature that reviewed fanzines. For each installment, Ted provided notes to clarify obscure terms and references; by his kind permission these notes are reprinted here for the first time in almost forty years. The fifth edition was published by Seacon, the British Worldcon, in 1979. It was accompanied by illustrations by British fan artist Carol Gregory. In 1980, TED appeared again, this time without illustrations, in Richard Bergeron’s 600-page, Willis inspired issue of Warhoon 28. That was the sixth edition, and was closely followed by a reprint of the third, Chamberlain edition orchestrated by Gary Farber. The eighth edition was published by Dan & Lynn Steffan in 1983. Although it reproduces the Ross Chamberlain map as endpapers, the cover and illustrations throughout are by Dan. This, in the various forms taken since, is the edition the reader is most likely to come across. 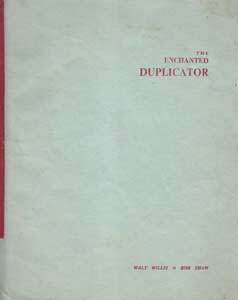 Next, The Enchanted Duplicator was performed on stage for Norwescon 5 in 1982. In 1985, the history of TED took a radical turn. A fan named Peter Trei created a version in ASCII and posted it on the prototype fannish email list SF-LOVERS Digest, which was hosted on a DEC computer at MIT. This version can still be downloaded from other sites – see the ASCII links below. There was at least one more paper edition of TED, produced by Greg Hills for the Melbourne Worldcon in 1988. Gregg credits it as the ninth, ignoring Trei's ASCII version as this was simply a transcription of the eighth edition..
One of the more interesting twists and turns in The Enchanted Duplicator’s career on paper was the attempt by Dan Steffan to adapt it as a graphic novel. Dan completed three episodes that he ran in his fanzine, Boonfark (issues 4, 6 and 8.) Unfortunately, the sheer work involved seems to have doomed the project. Not only were there no more chapters forthcoming, number 8 was the last issue of Boonfark as well. Every single version on-line is only the text. What of all the lovely illustrations by Eddie Jones, Ross Chamberlain and Dan Steffan? Those you can view only if you are lucky enough to own one of the old paper editions. Until now, that is. It is my good fortune to own three of the four illustrated editions, and I’ve scanned all three (see below). Much as I wish I owned the first and the Seacon editions, I don’t – but I have made an arrangement with someone who does own them to scan the pages at a later date. 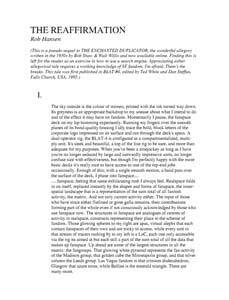 The first edition is now available here, courtesy of Rob Hansen. 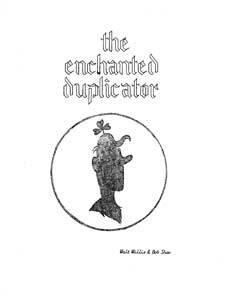 Once the project is finished, it will be possible, for the first time, for anyone to view all the illustrated versions of The Enchanted Duplicator. Naturally, the three chapters of Dan Steffan’s superb graphic version are also included. A few words about the colour illustration heading this preface. According to Dan, who painted it, the art was a gift to Walt Willis after his first stroke. It was never actually meant for publication – Jophan is shown as an older man with white hair at his temples, and represents Willis without being an accurate portrait. Walt asked if it could be posted on fanac.org with the text of his best remembered testament. Unfortunately, Dan tells me that the only known image is a fuzzy photograph taken by the owner. The whereabouts of the painting has been unknown since Walt’s death. So far I’ve said nothing about The Enchanted Duplicator itself. Clearly it has struck a universal chord among fans. I can think of no other example of fanwriting that has been republished so often – not even Willis’ trip report, The Harp Stateside. What can possibly explain such widespread sentiment? Mere nostalgia? Undoubtedly, TED’s popularity has much to do with its iconic depiction of how we envision ourselves as fans. We are not so naïve as to think we literally are Jophans, making the mental pilgrimage from the mundane to the trufannish. Nor do we believe that anyone else is as pure of spirit as Jophan. But there is still an unattainable ideal, that we would like to believe in. 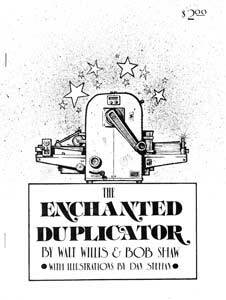 Walt Willis was clearly at the top of his form when he wrote The Enchanted Duplicator. As a writer, he was never more graceful or elegant. As an observer of fandom, he evoked all he knew about the true aims of fannishness and the pitfalls along the way. It is almost impossible to think of a danger or detour along the path to the Enchanted Duplicator that Willis has not already described. Even so, personally I find it difficult to fully appreciate The Enchanted Duplicator for what it is. Issues such as whether or not it is pure-hearted to take subscriptions, or to use a letterpress, seem irrelevant nearly 60 years later. While I’m not naïve enough to have ever believed fans were as pure of heart as Jophan, I’ve seen shades of grey among my peers that are not depicted in the pages of TED. Most of us have become post-moderns – we know what we do is a game, and not to be taken too seriously, yet the rules must be observed as though we do believe, or the game cannot be played. The world around us has changed, too – the line between mundane and fannish has blurred, the dichotomy become far less distinct than it was at one time. We live in a darker world than Jophan did. 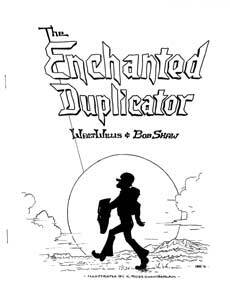 Yet it can hardly be denied that The Enchanted Duplicator is a classic, and remains close to fandom’s heart. Otherwise it would surely not have gone through as many incarnations as it has. The day may come when fans look back on fandom’s history with incomprehension. They will certainly not understand mimeos, locs, egoboo and subbers. They will speak in the language of blogs, comments, streaming and tweets – like, but not alike. Mere words may seem too stodgy in a world when all presentations are multi-media. They may also see no distinctions between the global on-line experience and participation in some little subdivision of it. In other words, we may live to see the word “fandom” become essentially meaningless. But as long as we are fandom, by self-definition, there will be an audience for The Enchanted Duplicator. Other artists may undertake the task of interpreting the story through their illustrations. There may even be other “sequels.” But even if paper becomes a thing of the past, someone will publish a new edition almost before the digital ink is dry on the old one. Bob Shaw – BoSh was an active cartoonist in his day, but it was clearly not his forte. In time he would become far better celebrated as a fanwriter. In the first edition there are no illustrations other than the iconic map that was reproduced verbatim in the second edition. Eddie Jones – Jones is now deceased, but in the 1950s he was very well known for his fan art in British zines. Late in the decade he made the transition from fanartist to pro, and even won the Hugo for Best Professional Artist in 1970 and ’71. Although not the first artist to illustrate TED, there’s no denying that he brought a professional touch to the material. It’s all the more impressive that Jones worked entirely on wax stencils, with primitive tools that would not look out of place in the hands of a manicurist instead of an artist. However, Jones’ work strikes me as harsh, even grim. Jophan is shown with the lined face of a man closer to 50 than 15, and never once in the entire 18 chapters does he really smile. In fact, our first sight of Jophan is disconcerting. His eyes stare out of the page with a fixity one normally associates with the bore of a gun. Nor is much relief to be found in the shield of Umor, which bears an expression of outright ferocity throughout Jophan’s adventure. Ross Chamberlain – It would be hard for me not to pick the Ross Chamberlain edition as my favourite. It begins with what is no doubt the definitive map of Jophan’s journey. 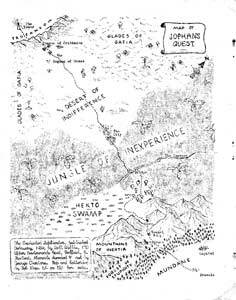 The Jones edition also includes an illustrated map, but it is a simple chart, spread out flat. Chamberlain’s is shown in elevation, and is an illustration in its own right. When we first sight Jophan, he is clearly a young man, and if he has a look of determination on his face, he is also optimistic. He is smiling. The shield of Umor is smiling. We’re off to a good start. As did Eddie Jones before him, Chamberlain worked with stencils and styli, an art form so obsolete by this date that fans born in the computer age would be hard-pressed to believe an explanation of how it was done. There are two exceptions in the art of this edition – the map and covers are offset. Dan Steffan – If not the Chamberlain edition, then the Steffan edition is my favourite. There’s little to choose between their art, as both are attractive and strike a good balance between cartoony and real. Of the two sets of drawings, I think Dan’s have a noticeably more serious tone. Unlike the previous illustrated editions, the eighth is offset throughout. While this makes far richer blacks possible, it also raises the amusing question of whether the editors have made a mistake about how to produce a fanzine – a mistake that that Jophan is warned early on not to make. When Dan undertook illustrating a graphic novel version of TED, rather than re-use any of the drawings from the eighth edition, he started from scratch. Telling a continuous narrative in drawings is not at all the same as picking key moments to illustrate. Even moments that only move the reader from one scene to another must be included. And yet the story can’t be reduced to a series of panels that only show one action after another, or it will bog down. To tell a story as a comic demands that it be effectively rewritten, and it was a godsend that Dan was up to the job. One only wishes he could have found the time and energy to finish the remaining fifteen chapters. It’s such a monumental job, though, that I can only suggest that there would be a slightly greater possibility of completion if the job were taken up by other artists for a chapter or two, and then passed on. Stu Shiffman – I’ve said in the past that Stu Shiffman is the perfect fanartist. By this I mean no disrespect to other fanartists, who have virtues all their own. But if I were to make up a fanartist, christen him Shaun Pen and suppose that he had every nuance of fandom – its style, its personalities and its rituals – down pat… he would only be Stu by another name. Except once. The Wise Old Fan is described having features that “were deeply wrinkled and his remaining wisps of hair hung about his head like a saintly halo, but the eyes in the weathered face still shone with all he brightness of youth.” Was it just me, or is there more of the wino than the sage about him when he first appears? Despite The Wise Old Fan, this is an impressive set of illustrations that succeed in bringing the timeless Enchanted Duplicator up to date. Carol Gregory – [No scans available]. 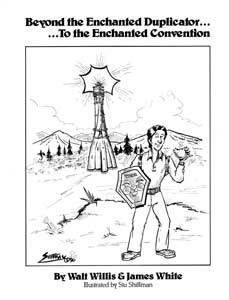 Beyond the Enchanted Duplicator…to the Enchanted Convention, by Walt Willis & James White, illustrated by Stu Shiffman.